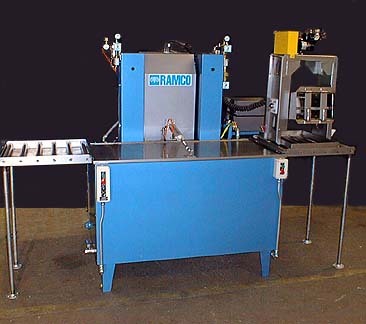 This Case History covers a system built in 1998 for a major manufacturer of aerospace components. The customer had to remove dye penetrant and debris from a variety of engine blades with recessed passageways and blind holes. Thousands of these parts were to be processed every day in batch loads. The important aspect to this application was the complete removal of contamination from deep crevices and intricacies within the components. 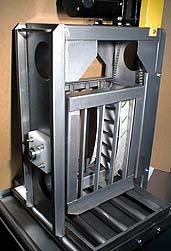 A precision sequence of processing stages had to be developed within a system flexible enough to allow for fine tuning of specific components. 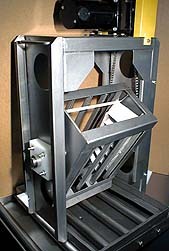 The configuration of some of the parts required rotation in lock-down fixtures. In addition there were a number of other components that did not require rotation and were much more easily handled in standard baskets. 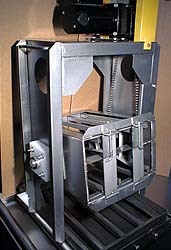 Therefore, the flexible washing system also had to have the capability of processing standard baskets or lock-down fixtures in Rotators (shown below). Each Rotator sits on top of the elevator platform and is transferred from station to station over roller conveyor sections. The engine blades are racked in lock-down fixtures within the Rotators, carried into solution and rotated, oscillated (in and out), etc. as dictated by the process. 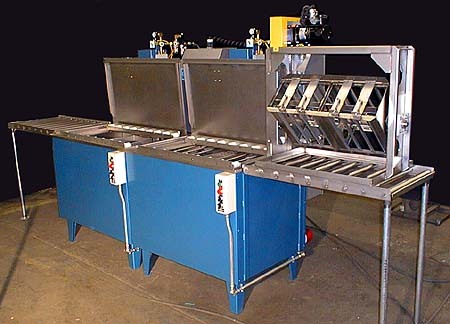 Multi Station Console (see below) and a dual fixture Rotator for two standard Agitating Washers (see above). Would you like to see another similar application?